Obama’s Climate Action Plan: How it miscalculates the social cost of carbon. Obama’s new climate plan is based on a dubious calculation and falls woefully short. 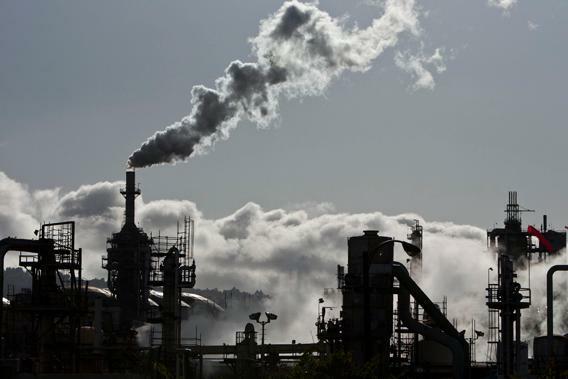 A ConocoPhillips oil refinery in San Pedro, Calif. The main contribution of President Obama’s Climate Action Plan, as Raymond Pierrehumbert explains, is its charge to the Environmental Protection Agency to regulate the carbon emissions of existing power plants. This could reduce U.S. carbon emissions significantly—but if the EPA uses the dubious set of calculations that the government has developed, its power plant regulations might be struck down in court. The story behind those calculations reveals the immense challenges the government faces as it finally addresses global warming. Although many gases contribute to climate change, the major culprit is carbon, which diffuses into the atmosphere when fossil fuels are burned. Carbon is emitted in vast quantities and takes a very long time to dissipate. Thus, any effective regulation must take aim first and foremost at carbon. The government cannot simply forbid emission of carbon, though—that would destroy the economy. The question is how to slow it down. Any economist would tell you that there is a simple answer. Just figure out the cost of the harm of, say, emitting a ton of carbon dioxide into the atmosphere (this is called the “social cost of carbon,” or SCC), and then impose a carbon tax equal to that amount. This is called a Pigouvian tax, after the economist Arthur Cecil Pigou. Easier said than done! The U.S. government has long shied away from Pigouvian taxes, preferring to embed the underlying calculations in more opaque regulations. And this is what it has done so far for climate. Hardly anyone knows it, but the National Highway Traffic Safety Administration already uses the social cost of carbon to calculate fuel economy standards, which increase the cost of cars. The higher price means that people buy fewer cars, and carbon emissions rise less quickly than they would otherwise. The SCC has also been used for the regulation of new power plants and of appliances such as air conditioners and gas ranges. So what is the SCC? The government says it is $38 per ton of carbon dioxide for the year 2015. To understand what this means, imagine that I’m building a power plant and could install a machine that would reduce carbon emissions by 1 million tons. The EPA would force me to install the machine if it costs less than $38 million and not if it costs more. If the government used this SCC to charge drivers a Pigouvian tax on gasoline, it would translate to about 40 cents per gallon. Nordhaus’ model starts with the historic growth rate of the global economy and then estimates the amount that climate-related damage will reduce it. The problem, which Nordhaus candidly acknowledges, is that no one has any idea what the economic impact of climate change will be (other than that it will be very bad). So he waves his hands and makes a guess based on his reading of various climate studies. The key claim is that if mean global temperatures increase by 2.5 degrees, global GDP will decline 1.8 percent. If global temperatures rise more, the decline will increase quickly. But in no realistic scenario does the model predict that the harm from climate change will completely wipe out economic growth—global GDP never levels out and declines. The group considered the costs and benefits of climate regulation over 300 years—until the year 2300. This is important because most of the cost of regulation will be borne early in this period, and most of the benefits will appear at the end. You might think the government should not try to predict the future 300 years hence—perhaps by then people will be stored in computer networks and interact via avatars—but if you don’t make some guess about the distant future, you can’t justify regulations designed to benefit it. As noted in an insightful new paper by my University of Chicago colleague David Weisbach and several co-authors called Climate Impacts on Economic Growth as Drivers of Uncertainty in the Social Cost of Carbon (unfortunately not yet online), the government’s assumptions lead to some bizarre conclusions. Because global GDP can only increase, and because 300 years is a very long time for the economy to grow, even at a low rate, people will be vastly wealthier in 2300 than they are now, according to the Nordhaus model, even if the government does nothing about climate change. In one scenario, temperatures rise 6 degrees (a level that some scientists believe would be cataclysmic), yet per capita income would be 30 times higher than what it is today—that is, $1.5 million per household in the United States rather than $50,000. Why should we incur costly regulation today to help remote descendants who will dine on caviar and travel by jetpack? The answer, according to Weisbach and his co-authors, is that they won’t. The problem lies with the models that assume that GDP won’t fall. But if climate change hurts productivity rather than just overall output, GDP could fall. And if it falls year by year, even by only a little bit, then 300 years from now people will eat grubs and live in caves. The government’s analysis falls short in other respects as well—two of which I discuss in a paper with my colleague Jonathan Masur. First, because Obama’s climate regulations will raise the cost of production and hence prices in the United States, some industry will move offshore. If, for example, the EPA’s power plant regulation pushes down the demand for coal in the United States, coal producers will export coal abroad, where it can be used to power manufacturing of the very products that are no longer manufactured in the United States because of high energy costs. These products might even be imported back into the United States! The estimates vary widely, but lots of migration diminishes the benefits of regulation—which means that regulation based on the $38 per ton SCC could cost us a lot of money without improving the climate. Second problem: 96 percent of the global population lives outside the United States. Obama lacks any clear authority to regulate for their benefit, and in other contexts, when agencies perform cost-benefit analyses, they generally take account of the effects on Americans only. That’s what the EPA does in calculating how to regulate lead or mercury emissions. If the government must regulate carbon only for Americans, too, then again the $38 SCC is too high. The bottom line is this: The current SCC calculation embodies the worst of both worlds: too low from the standpoint of global well-being, too high from the standpoint of law. When power companies challenge the new climate regulations in court—we won’t have to wait long—they will argue that the rules fail a cost-benefit analysis. Courts don’t always demand cost-benefit analyses, but they sometimes do, and even if they don’t here, the arbitrary assumptions underlying the government’s number will bother them, as they should. Only Congress can solve these problems—by passing a law, which unlike a regulation by the president could withstand legal challenge, and by authorizing an international agreement, which would ensure that foreign countries reciprocate our actions. But Congress doesn’t want to play. The best defense of the Climate Action Plan, then, is that by driving the United States down the path of costly and futile regulation or endless litigation, it may finally prod Congress to get into the game.